This is a really delicious and sublimely simple recipe. If you like Indian flavors you have got to try this! As the mackerel cooks the skin goes nice and crispy. The key here is to fry this fish in mustard oil if you can get your hands on it (easily available at Indian/Asian grocery stores). When cooked in mustard oil the taste is completely different and takes the fish to another level. You could use other vegetable based oils if you have and I am sure it would taste fine, but the real flavors of this dish will truly come alive if you use mustard oil. Great served simply with a nice salad with a lemony dressing in the midst of summer or even on wet rainy days. It could also be part of a beautiful Indian meal with some rice and yellow daal and an onion tomato lemony salad. Bear in mind when selecting your mackerel, go for smaller fish. I think they taste better. On this occasion I went to china town and they just did not have the smaller ones, and I had really been dreaming of eating this for days on end so I just went with the longer/bigger mackerel that were available. Also please make sure your fish is really fresh and has no fishy smells. 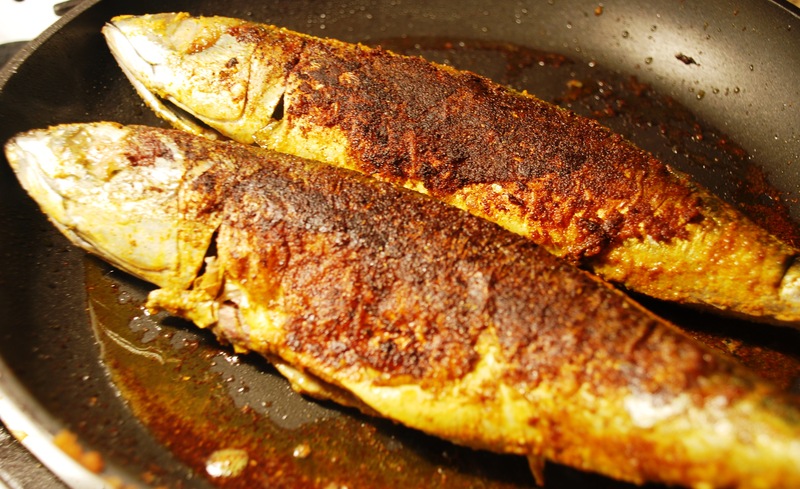 Wash your mackerel and dry with a paper towel. Rub it all over with some lemon juice and sprinkle salt inside and out. Combine all your dry spices in a bowl and mix. Now sprinkle this spice mix all over your fish and inside the stomach cavity too. Heat mustard oil in a heavy based frying pan. Add your fish and cook on all sides on medium heat, till flesh is flaky and the skin is crispy. Serve with lemon wedges.